Stewart Maxcy surfed locally in Flagler Beach, Florida for over 35 years and has combined his love of the salty lifestyle with his art. Most of his work is ocean related. 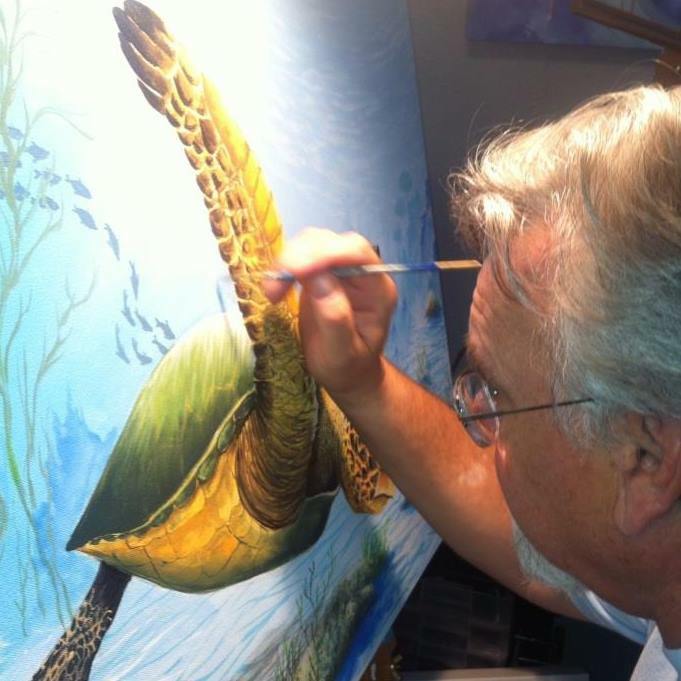 His subjects include Sea life, surfing, intracoastal waterway landscapes,etc. His work has been displayed in several galleries, surf shops, and various businesses. Stewart Maxcy recycles used surfboards by using them to create on, instead of a typical artist's canvas. He paints beach scenes above the water,underwater scenes, or split views. Since old surfboards never decompose in our landfills, using them as unique art keeps them out of our landfills. Purchasing his art makes a positive environmental impact. Stewart's art can also make a statement about your lifestyle and love of the water. Most of the boards that Stewart has painted are custom orders, sold before he begins. The clients tell him the elements they want and Stewart puts them together in a rough sketch. Then Stewart preps the board, does the art work. Then clear coats are applied and hangers installed, hidden on the back back of the boards. The clients receive their board ready to hang. Stewart paints the boards in vertical or horizontal formats. Lately Stewart has had more people furnishing boards they no longer ride, that they currently ride, or new boards to paint. Stewart's work provides people with a unique, custom and personalized board.